Summary for the Busy Executive: Clueless in Cambridge. There's probably something to be said for the existence of national styles. Despite the cultural inheritance from Britain, no one would mistake American culture for British. This CD testifies to the difference in performance and composition styles as well. I kept listening and thinking to myself, "They just don't get it." The creamy British cathedral choir sound really is at odds with the biting, in-your-face style of classic modern American composition. If you can imagine Prince Philip doing a Lenny Bruce monologue, you'll get a good idea of the effect made by the King's College Choir. It struck me once again how intimately our popular culture hooks up with our art, or even how the best of our popular culture is art. Britain's dramatic venue is usually the stage. Ours is more often the movie. You find Britain's great satiric tradition in print, ours in clubs. Mark Twain's prose twangs with Arkansas and Missouri, while Joseph Heller writes in the cadences of a Borscht-Belt comic. Andrew Lloyd Webber and Paul McCartney dream of writing oratorios and symphonies. This side of the pond, Milton Babbitt dreams of becoming Cole Porter, and Aaron Copland once considered following Richard Rodgers. Leonard Bernstein and George Gershwin wrote both for Broadway and the concert hall. Bernstein couldn't stop himself from bringing the concert hall to the Broadway "show," with balletic punks and sailors and with ingenues who can toss off coloratura runs on or near the high C's. Of course, for Bernstein it worked the other way 'round as well. Parts of the Chichester Psalms swing to the rhythm of the Puerto Rican Sharks. The CD's liner notes point this out, but the writer implies a problem: Bernstein couldn't make up his artistic mind, as if he couldn't decide on what he wanted to be when he grew up. The writer really does miss the point. One of the great things about the U.S. is that an artist, if lucky, can be assaulted by all sorts of junk as well as by great art, and furthermore the diversity of both is astounding. High priest Milton Babbitt swings, by God. It was Bernstein himself who in the 1930s pointed out that Copland's rhythms probably would not have occurred to anyone unfamiliar with jazz, and Copland recalls that his teacher Nadia Boulanger was most interested in his rhythms. The closest I can come to finding this kind of duality in British music is Walton's Facade, and that probably owes just as much to Cocteau and Les Six. Michael Tippett loved Ellington's music, but I don't see him turning Ellington to his own ends. Besides, it's all a little too self-conscious. The U.S. composer comes to it without much thought. Our performers, of course, also get this same kind of total-immersion baptism. Those singers, for example, who in my opinion represent a real American school, include Sills, Eileen Farrell, John Reardon, Sherrill Milnes, Adele Addison, Marilyn Horne, and Thomas Young - all artists who have, in addition to classical chops, affinities with Broadway, pop, and jazz. John Reardon in particular moves from classical to Broadway to pop with not only no jar, but also no discernable change in style. He doesn't need to change. He fits. 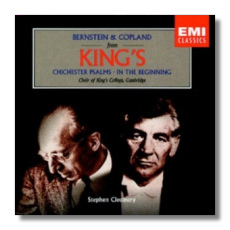 Kings does best in the Chichester Psalms, but you have only to compare either of Bernstein's recordings to know immediately what's missing: sharp attack and real rhythmic elan. It all sounds schooled - like a recital piece - rather than fancy free, particularly in the "Lamah rag'shu goyim" ("Why do the nations rage?") section. It evokes a bunch of Hebrew grammarians parsing than the passionate psalmist. Phrases throughout seem extruded into little sausages, with no feel for the arrival point of a thematic group, and the diction is as loose as oatmeal. You begin to long for a consonant, any consonant. The same problems afflict every other piece. You can't understand the words and the rhythm sounds drilled, rather than spontaneous. Cleobury also makes some questionable choices of tempo - too slow - which means of course that he can't sustain the tempo he sets, and we get more sausages rather than musical lines. The Copland - one of the finest a cappella pieces by an American - limps along, sans the pizzazz Copland builds into the piece. "Let there be lights in the firmament of the heaven" should sound like light dancing visible. King's don't swing. What should come across as the choral translation of Appalachian Spring instead behaves proper in church. Toothlessness sinks the Schuman and the Larsen, setting the poetry of Whitman and Rilke, respectively. Presumably these composers were moved by the words to want to fit them to music in the first place. Not getting the words across misses the point. The Gregg Smith Singers recorded the Copland, Ives, and Schuman on classic LPs long out of print. Rather than throw away your money here, wait for those to return, like Arthur. In saying all this, I must remind myself that I have many King's CDs that I treasure, but it's almost all in British repertoire. I begin to wonder whether Americans sound to Brits as hopeless in British repertoire as King's sounds to me in American - as out of place as a camel in a bowling alley. On top of all this, sound levels are way under-recorded.